Video: Three Little Pigs Nachos and White Queso Recipe. PLUS a giveaway! 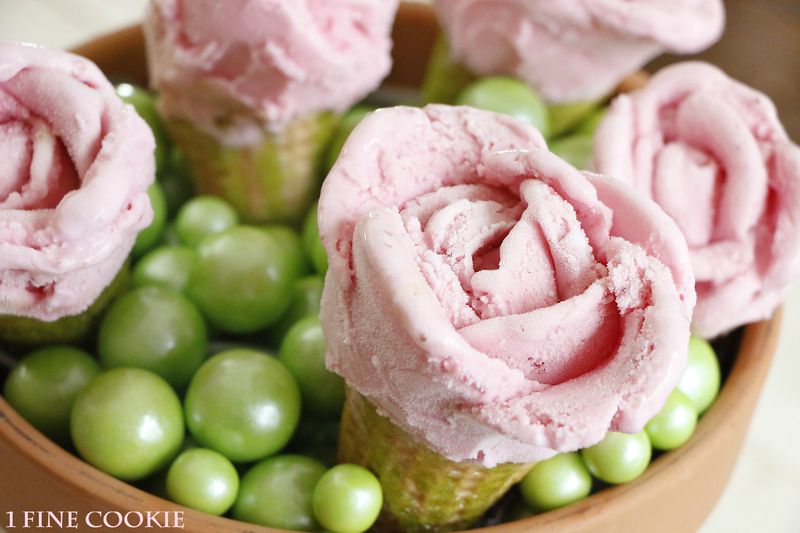 How to Make Ice Cream Roses. A tutorial. 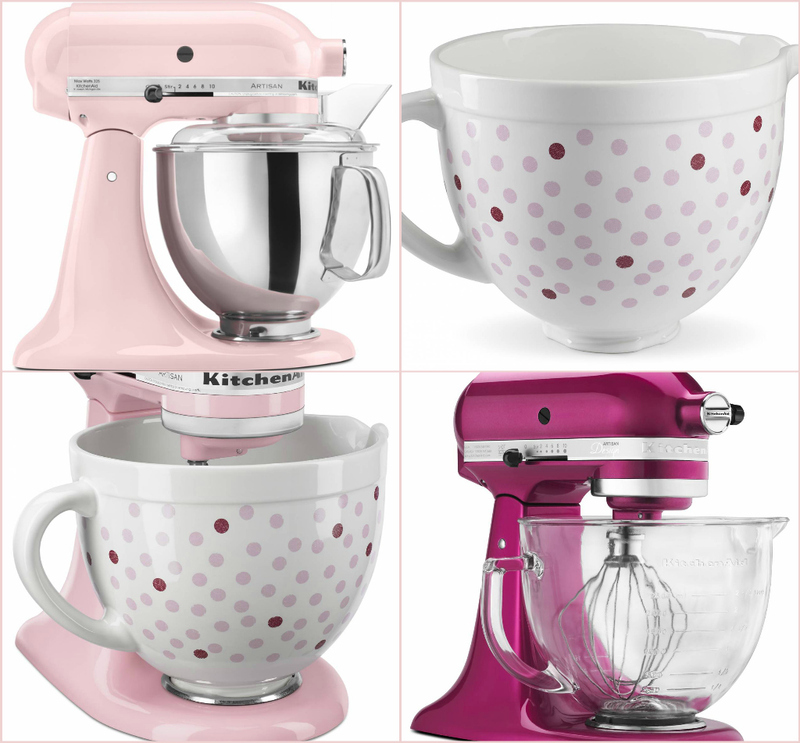 1 Fine Cookie and KitchenAid have teamed up this month in support of Cook for the CureÂ . ForÂ the past 14 years, KitchenAid and Susan G KomenÂ® have partnered for Cook for the Cure. By engaging passionate cooks with simple, creative ways to support a meaningful cause, thisÂ wonderfulÂ program has raised over $10 millionÂ and countingÂ for the fight against breast cancer. This year, KitchenAid is debuting a brand new pink polka dot ceramic bowl in time for Motherâ€™s Day to raise awareness for the fight against breast cancer and celebrate this partnership. The ceramic bowl will be available late summer/early fall. Here it is along with other products from the Pink Collection, all in celebration of Cook for the Cure. Whoever said diamonds are a girl’s best friend clearly never owned a stand mixer. Boys too. They can be a boy’s best friend too. I wanted to fill the ceramic bow with something pink, in celebration of Cook for the Cure. Pink champagne ice cream is tart, light, and very pretty indeed. I can’t imagine a champagne lover who wouldn’t try this out. 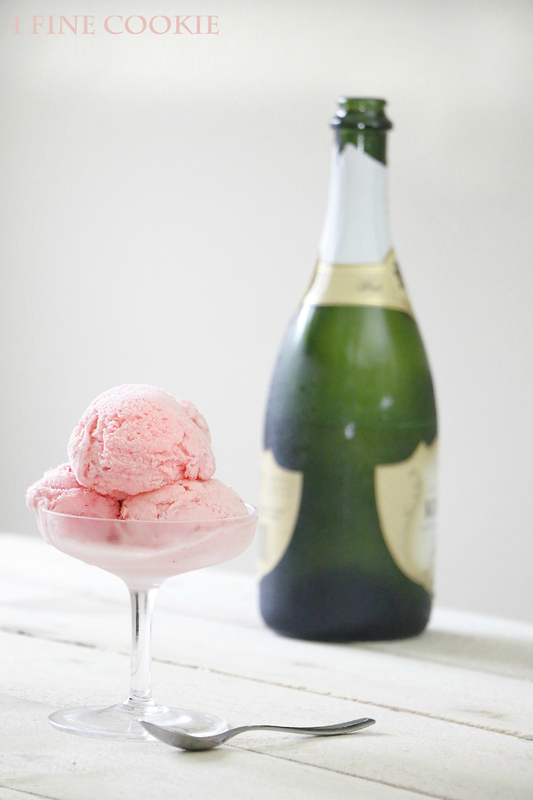 * I used a tip for incorporating the champagne into my pink champagne ice cream from the book, Champagne Happy Hour. Check it out! 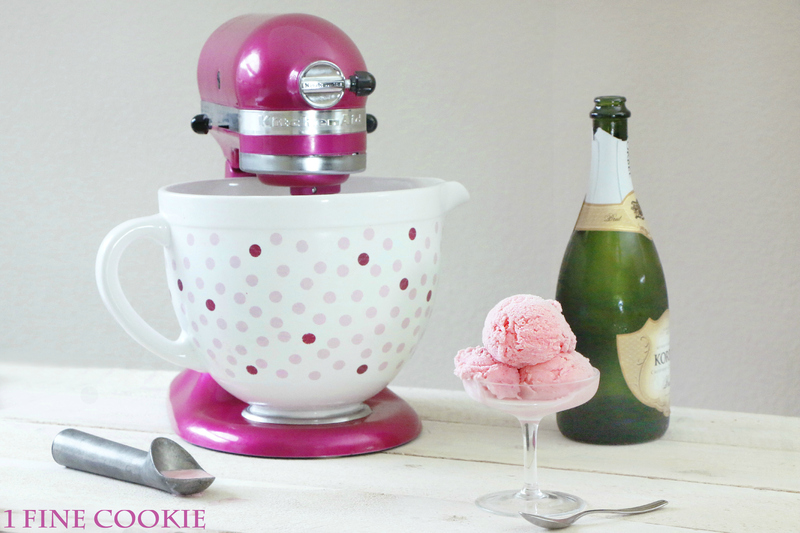 To start your pink champagne ice cream recipe, place ice cream maker in freezer according to manual instructions. Combine milk, cream, sugar, salt and vanilla in a sauce pan. I added quite a bit of vanilla to compliment the champagne.Â Heat on stove until sugar has dissolved and mixture is scalding hot (but not bubbling or simmering). Remove from heat and slowly pour a bit at a time into eggs, whisking very quickly. You want to heat the eggs but not cook them so be careful! Once 2/3 of milk mixture is incorporated into eggs, place sauce back pan on stove and pour eggs into pan while whisking. Heat on medium and mix until it thickens into a custard. Strain custard into a bowl sitting on ice and place in fridge to cool off. Pour a packet of gelatin into 1/4 cup of cold water. Once gelatin absorbs water, heat on low until gelatin is totally dissolved. Remove from heat and strain into a bowl. Mix in champagne and whisk. 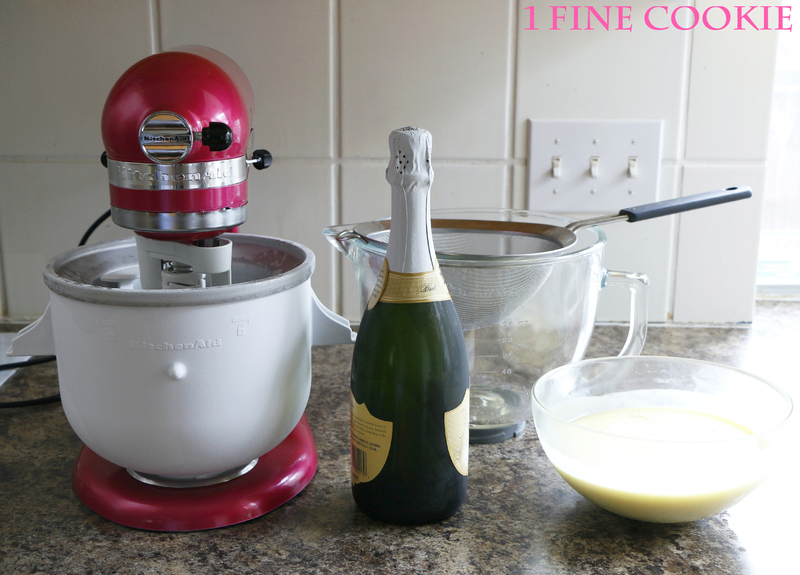 Pour cold custard and champagne mixture into ice cream maker attachment and whisk. Turn on ice cream maker on low and add pink food coloring intoÂ champagne ice cream custard. Mix until pink champagne ice cream becomes thick and starts to freeze into a slush. Push through strainer into bowl. Cover and freeze until hard. What’s better than champagne? Champagne AND ice cream. Pink champagne ice cream is the new black. ***If you are considering posting up photos or ideas from this Pink Champagne Ice CreamÂ postÂ or any other posts I am truly happy that you Â find my recipes interesting enough to share with others. Â Writing and photographs are copyright protected under theÂ DMCA, unless otherwise noted.Â Please see copyright standards in the footer (bottom) BEFORE you use photographs and/writing from this website. 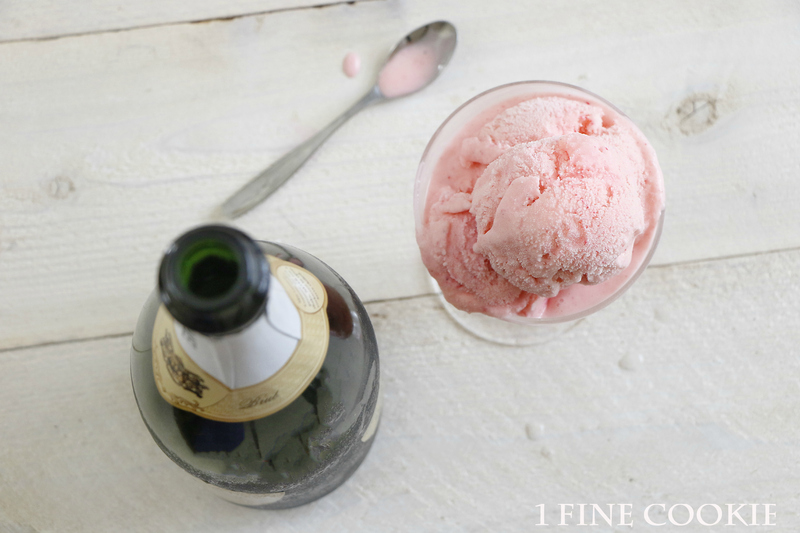 Pink champagne ice cream is a tart and pretty frozen dessert for any time of year. Ice cream maker attachment for your stand mixer. Place ice cream maker in freezer according to manual instructions. 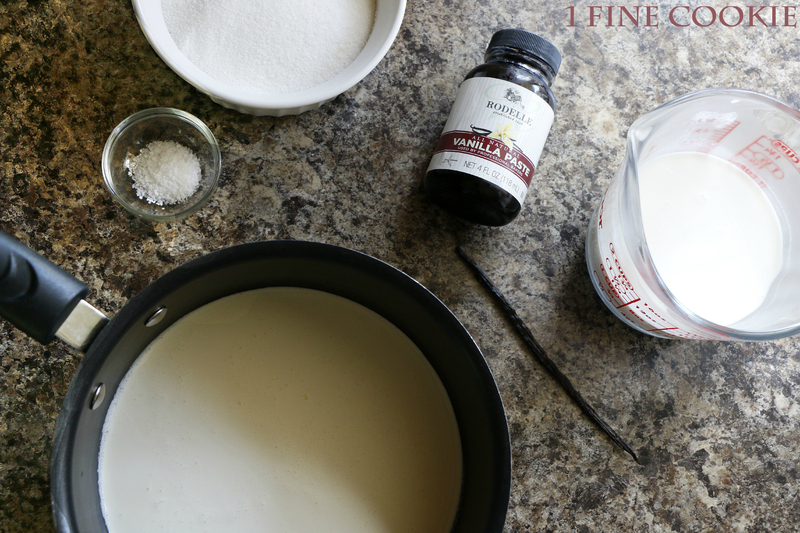 Combine milk, cream, sugar, salt and vanilla in a sauce pan. Heat on stove until sugar has dissolved and mixture is scalding hot (but not bubbling or simmering). Remove from heat and slowly pour a bit at a time into eggs, whisking very quickly. Once ⅔ of milk mixture is incorporated into eggs, place sauce back pan on stove and pour eggs into pan while whisking. Pour a packet of gelatin into ¼ cup of cold water. Once gelatin absorbs water, heat on low until gelatin is totally dissolved. Remove from heat and strain into a bowl. Mix in champagne and whisk. 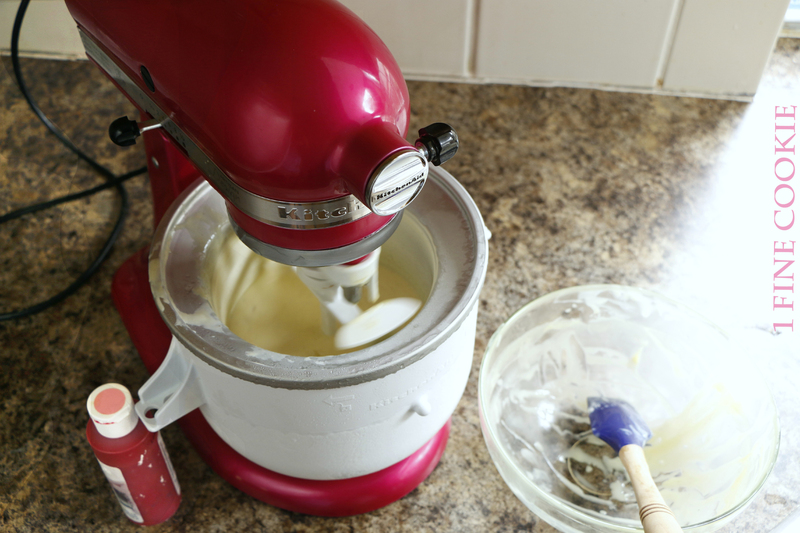 Pour cold custard and champagne mixture into ice cream maker attachment and whisk. Turn on ice cream maker on low and leave until custard becomes thick and starts to freeze into a slush. Push through strainer into bowl. Cover and freeze until hard. 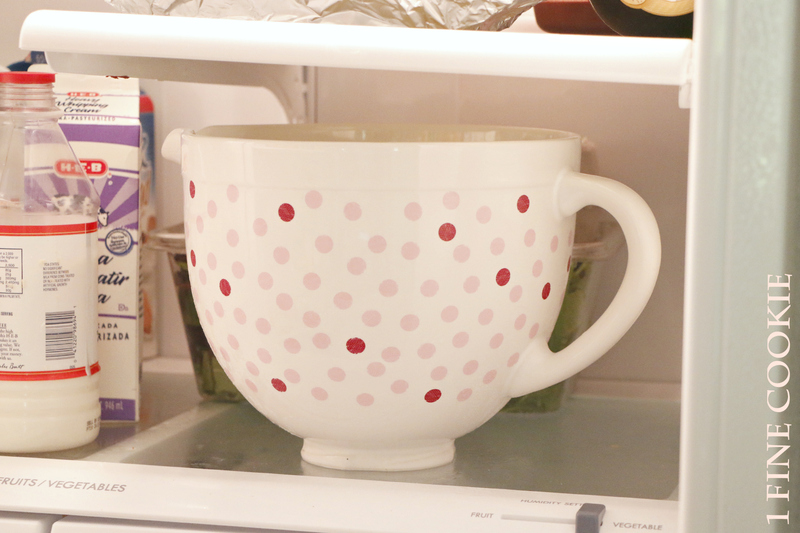 were can i buy that ceramic polka dot Bowl? I checked on their page and did not see it…were did you get that info from ? @Ilonna, will not be selling for a few more months. In October I may be hosting a giveaway for the bowl and mixer, so check back in.